LPNs are valuable members of a health care team. Their one-on-one relationships with clients call for compassion, patience, and competence to cope with those in physical and emotional distress. Prospective LPNs should have excellent decision-making, communication, and observational skills to succeed on the job. Since LPNs must work closely with registered nurses and physicians, and under their supervision and guidance, they must value teamwork. The U.S. Bureau of Labor Statistics projects a shortfall of licensed professional nurses for the next decade. The projections suggest that is it indeed a great time to complete the training to become an LPN to obtain employment in a stable industry. Employment opportunities for LPNs are predominantly in long-term and home health care where they assist aging persons and patients coping with chronic illnesses or recovering from surgery. LPNs in home health and long-term care provide basic nursing skills, prepare patient meals, educate families, assist with the activities of daily living, and monitor vital signs. West Virginia’s approved practical nursing training providers equip students with the knowledge and skills to practice safe nursing that impact patients’ health and qualify of living. The programs comprise of lecture and laboratory instruction along with training at a clinical site. Students must attend all the clinical sessions to qualify for graduation. In the classroom, instructors cover care for children, adults, seniors and persons with disabilities. Students learn how to administer medications, process medical records, collect medical specimens, perform IV therapy, care for wounds, conduct physical assessments, perform routine lab tests, monitor vital signs, assist patients with the activities of daily living, perform phlebotomy and give injections, evaluation patients’ emotional status, and communicate effectively with other members of the patient care team. Students also learn how to actively participate in the assessment, planning, implementation, and evaluation of nursing care. The clinical rotation may take place in a variety of health care facilities to expose students to an LPN’s role in each setting and reinforce the theoretical principles covered in the classroom. Entry requirements vary but may include completion of the school’s application, evidence of high school completion or equivalent, passage a pre-entrance exam, a personal interview with the department’s administration, a pre-entrance physical exam, PPD or chest x-ray, immunization, evidence of good mental and physical health, pre-admission elective classes, and a criminal background check. Pre-elective classes may include college composition, mathematics, chemistry, anatomy, medical terminology, medical math and CPR. Some schools require applicants to attend a mandatory information session as part of the admissions process. Upon completion of the training, graduates will be eligible to take the NCLEX-PN. They will also have the knowledge and abilities to meet the healthcare needs of the community within the scope of practice defined by the West Virginia Board of Nursing. Duration and Cost of Training: The time to complete a practical nursing program is 12 months. However, factors such as the degree conferred and the total number of credits the student complete each semester could also affect the duration of training. In general, practical nursing programs call for full-time enrollment only. However, there are a few part-time options which can extend training to 18 months. The average program costs $7,600 in West Virginia, but there are programs that can get as costly as $23,500. Ask about the advertised cost as it usually does not include essential expenses such as course materials, textbooks, clinical supplies, lab supplies, admission fees, admission testing requirements, transport to the clinical sites, liability insurance, and pre-elective courses. Practical nursing students may qualify for partial funding of their costs through grants, loans, and scholarships. Graduate nurses must file an application with the Board of Nursing and pass the NCLEX to qualify for licensure in West Virginia. The candidate must submit an application to Pearson Vue online or by phone (1.866.496.2539) at the same time he or she submits an application to the KBN. The fee for the NCLEX is $200 and is payable using a credit card at the time of submitting the registration request. The KBN determines candidates’ eligibility to take the exam based on a review of the completed application, criminal history record, nursing school transcript, and confirmation that the candidate submitted all applicable fees. Pearson Vue issues the Authorization to Test (ATT), via email, to qualifying candidates, with the Board’s approval. It is important to include an accurate email with your registration as it is Pearson Vue’s primary mode of communication with candidates. Once you receive the ATT, you should check the letter for corrections in the spelling of your name, address, and other personal information. The ATT will indicate an expiration date, which is usually within 90 days. It is during this time that you must schedule a test date at a convenient testing center. It is not possible to extend the ATT expiration. If you miss the date, you must submit a new application and fee. The Candidate Bulletin contains critical information that will help you prepare for the exam. So while your focus may be on review booklets and notes from the nursing education program, don’t overlook this valuable resource. In the booklet, you’ll find information on what to expect on exam day, what to take with you, an overview of the exam format and content, what to expect if you pass or fail, and how to reapply for the exam. Your exam results will be available within a few days. The Board will communicate the information once they receive the results from Pearson Vue. If you pass the exam, you will receive confirmation of your license if you meet all the other requirements. If you fail the exam, you will receive a Candidate Performance Report (CPR) that will outline your responses to various sections on the exam and highlight your strengths and weaknesses. To retake the exam, you must submit new applications to Pearson Vue and the Board. You can fill out the simple one-page application to the Board and submit the $75 application fee to obtain approval to retake the exam. After three successive failed attempts, you must submit a complete application and all the required documents. Any individual who wishes to obtain a license to practice nursing in West Virginia must submit an application to the Board, remit the applicable fee, and provide evidence of a good moral character, a minimum tenth grade education or equivalent, completion of a course of study in practical nursing, and any other requirements defined by the Board. Members of the US Armed Forces who served on active duty in the medical corps for at least one year within a 3-year period before submitting an application to the Board must submit evidence of completing a course of instruction. The instruction must qualify the individual for a rating as a medical service technician, medical specialist advanced, advanced hospital corpsman or equivalent rating in the armed forces. The applicant must also demonstrate evidence of “honorable” discharge. Foreign-educated nurses must provide satisfactory evidence of completing a basic nursing education program that meets the minimum requirements of the Board of Nursing in West Virginia. The applicant may need to complete any deficiencies in the nursing program to qualify for licensure. Foreign-educated nurses must also provide evidence of English proficiency through the passage of a recognized English proficiency exam. Nursing graduates must pass the national licensure examination prior to licensure. Complete the application for licensure by examination. Attach a passport sized photo signed by you and the director of the nurse education program to the application form. Request a transcript of your grades covering the entire 12-month course to be sent directly from the school’s registrar to the Board’s office. All grades must be “C” or above. Enclose the application fee of $75 plus $10 if requesting a temporary permit. Payment must be in the form of a cashier’s check or money order. Furnish a full set of fingerprints for conducting a criminal history record check. The CBC will involve a record check through the criminal identification bureau of the West Virginia State Police and the Federal Bureau of Investigation. Provide a copy of the final disposition and a written explanation if you answer “yes” to the criminal history questions or a copy of the disciplinary action and a written explanation if you answer “yes” to the disciplinary action questions. Sign the application before a Notary Public. Submit a credentials evaluation completed by CGFNS, ERES, IREF, or Josef Silny and Associates directly to the Board. Submit evidence of completing any deficiencies in the theory or clinical aspects of the nursing education program as determined by the Board. Provide evidence of completing the nursing education in English – textbooks, clinical experience, etc. Provide an original report showing a minimum score of 530 on the written exam or 200 for the computer exam on the TOEFL plus a minimum score of 50 on the TSE. Provide an original report showing a minimum score of 700 on the TOEIC plus a minimum score of 50 on the TSE. Official verification of licensure (translated in English) from the licensing agency. The temporary permit is valid for 90 days only. Upon receipt of the permit, nurse graduates can practice until receipt of the results of the licensure exam – not to exceed 90 days. The Board will issue a license by endorsement to any applicant who holds a license as a licensed practical nurse and entitled to perform services in another state, territory or foreign country. Complete the application for licensure by endorsement. Answer ALL questions. Enclose the non-refundable application fee of $50. Payment must be in the form of a cashier’s check or money order. Submit verification of your license through Nursys if your State Board participates. If not, use the license verification form. Complete the first four lines, contact the licensing agency to find out the cost for verification, mail the licensure form and the required fee (mail one to every state where you hold a license) and request that the agency complete the mail the form directly to the WV Board of Nursing. The Board will issue a letter of permit to practice to the applicant upon receipt of the completed application and fee. The applicant may use the litter and current license from another state to practice in West Virginia for a period not to exceed 6 months. LPNs must complete 24 contact hours of continuing education and practice for a minimum of 400 clock hours in each 2-year reporting period. Reporting occurs in even-numbered years. Licenses expire on June 30 every year. LPNs must renew their licenses on time to continue practicing. Licensees must submit a completed application for renewal, the renewal fee, and a statement (on even numbered years) attesting to completion of the continuing competency requirements. LPNs must complete two contact hours in end of life care and pain management and report those hours during the first licensure renewal. Applications postmarked after June 30 will be considered lapsed. The Board will reinstate a lapsed licensed after the candidate submits a completed application for reinstatement, the reinstatement fee, and verification of the continuing education requirements. Members of the armed forces on active duty will be exempt from the renewal requirements while on duty and for a period of 6 months after discharge. The licensee could renew without penalties and the need to complete the continuing education requirements if circumstances associated with the military duties prevented the individual from fulfilling the requirements. The United States Bureau of Labor Statistics has projected a 21% growth in employment for LPNs by the year 2022. The industry rate is faster than the average growth of other industries, which is good news for anyone desirous of pursuing a career in nursing. 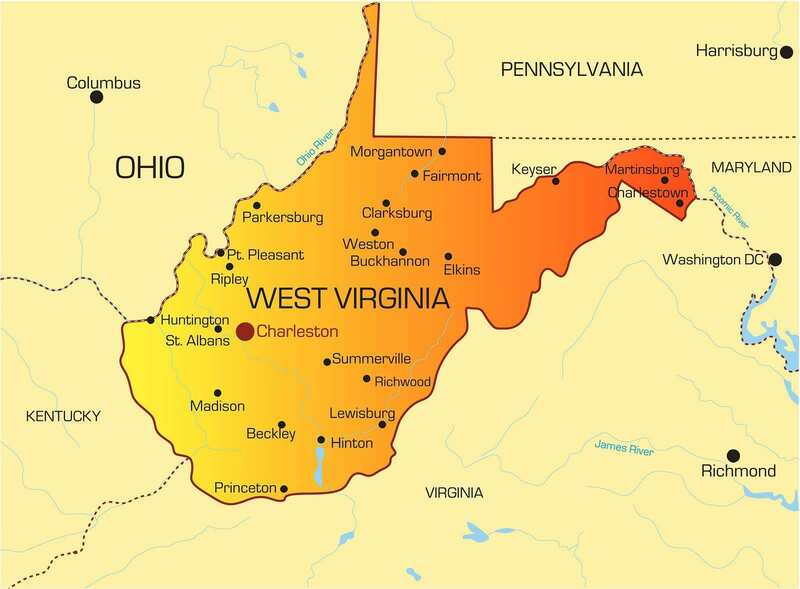 Job opportunities for LPNs in West Virginia are on par with the national demands. There were 6,710 LPNs employed in May 2014 according to figures from the BLS. Based on the projected rate of growth, the state will add approximately 1,400 new jobs by the year 2022. The projection does not include vacancies left by retiring nurses or those who advance to other positions. The contributing factors for the increase in employment impact the places where the need arises. For instance, a key contributor to demands for LPNs is the rising healthcare needs of the Baby Boomer population. As such, vacancies for LPNs are available primarily in long-term and home health care settings. Experienced LPNs may be fortunate to land enviable positions in the state’s leading hospitals to replace outgoing nurses. Hospital positions are mostly in emergency rooms and outpatient care. Physician offices, clinics, state agencies, correctional facilities, and schools also hire LPNs to provide care and counseling. The average annual salary for LPNs in West Virginia $35,020. Need Togo straight to BSN program. too many different education levels waters down the profession of nursing! True. But I make decent money and just do meds, some shots and some paperwork. There are a lot of great LPN jobs. Clinics, hospitals, home health, long term care. RN bridge programs are available for LPNs and you can work and get experience while getting your RN a little faster. Many places will help pay for your RN school also. I was an LPN who went on to become an RN. Believe me everything I needed to know about nursing, I learned in LPN school. Just sayin. LPNS make the best RNs…. Tonya Cruz you don’t have to go to the school you only have to take the test !!!! Where can you just take a test? Yes, you do have to go to school. You can’t just go take the test and be a LPN. I have already graduated from LPN class, she was just saying all I have to do is pass my boards. I have been an LPN since 1988. It has been the most rewarding job and career i could have ever imagined. I love and feel very blessed to work with Veteran My Heroes everyday. Yes it is very hard work, but i sleep very well everynight. A lot of bare areas on the map! Just my opinion being a cna makes a better lpn and being a lpn makes a better rn. I habe worked with both lpn’s and RN with no experience but book and clinicals and I would rather have the others to work with. Just because they know how the others work. And how it really takes a team of health professionals to do the job. And yes I was a cna for 16 years and now I’m a lpn for 8 years and yes I am going for my rn. I agree i was a CNA before I was an LPN, So I knew if I wanted to know about a Patient I asked the NAS no one knew them better.. It depends on what state you work in i worked in Ohio as an LPN and made more on the.hour than the RNS did in WV.. When a Brain Tumor ended my nursing career in June of 2003, I was making 24.40/hr that was a lot of money to make back than for an LPN..